Ear mites are small parasites that live in the ear canals. They may stimulate excessive wax production that can lead to clinical signs such as head shaking, ear scratching and blood around the ear canal. 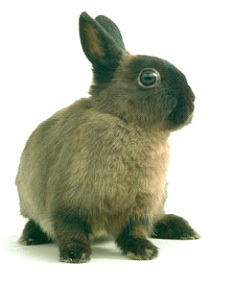 They are seen most commonly in the lop eared breeds. 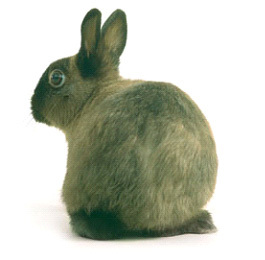 Mites may also infect rabbits on the back and shoulders causing dry skin and dandruff. These mites can also cause a mild rash in humans, so treatment is vital. If bedding is not changed regularly (at least once a week) rabbit feet can become ulcerated and infected. Feet should be checked regularly and toenails clipped if necessary. Rabbits can develop eye infections that may be difficult to treat. These present as a milky white discharge from the corner of the eye and may result in sore reddened skin just below the lower eyelid. Tear ducts often become blocked and will need to be flushed. Tear ducts also become blocked when molar tooth roots grow abnormally. This is the most common problem encountered by vets and may result in the rabbit having to be put to sleep if not treated at an early stage. Rabbit’s teeth grow constantly throughout their life and if there is not enough fibre in the diet, or if the teeth are not aligned properly, then they will overgrow. Overgrown teeth become spiked and will start cutting into the side of the mouth and the tongue causing mouth infections, ulcers and inability to pick up food and eat it. Typical signs include poor appetite, weight loss, salivation/dribbling and abscesses around the face and jaw. Also eye infections and matted droppings around the tail base may be an indication of dental disease. In some rabbits, malocclusion of the incisor (front) teeth is congenital (present from birth) and these rabbits will need vigorous treatment and possibly tooth removal. Acquired malocclusion occurs in older rabbits and is thought to be primarily diet related. A correct diet is essential to your rabbit’s wellbeing (see section on feeding) and problems occur particularly if your pet is not eating enough fibre in the form of hay, grass and vegetables. Problems can also arise if your rabbit refuses to eat the pelleted part of the dry diet since these contain calcium and phosphorus essential for good bone and tooth growth. Rabbits need regular teeth checks and these should be carried out at the time of vaccination. Diarrhoea is a common problem in pet rabbits. It is a very serious condition and veterinary advice should be sought immediately. Some gastrointestinal infections that result in diarrhoea can be fatal in less than 24 hours. Rabbits with diarrhoea become rapidly dehydrated and will need fluid replacement. A high fibre diet (hay or grass) has a protective effect against diarrhoea and soft droppings. Occasionally obese rabbits, older rabbits with back problems and rabbits with dental disease become matted with droppings around the tail base. It is normal behaviour for rabbits to produce softer droppings at night (caecotrophs), which they then eat. This is an important part of the rabbit’s diet. If rabbits are very overweight, or have a painful mouth or back, they may be unable to reach round to clean these droppings away. In the summer, diarrhoea or matted soft droppings may attract flies which lay their eggs around the tail base and these hatch out into maggots. You should check your rabbit twice daily in the summer and always make sure the bedding is clean and dry. A fly strip hung just outside the hutch may help reduce the flies. Many rabbits have bacteria, called Pasteurella, living in their nasal sinuses. These bacteria will not cause a clinical problem for a rabbit with a healthy immune system, but in certain situations, if the rabbit becomes stressed, these bacteria will multiply rapidly causing a disease known as Pasteurellosis or ‘Snuffles’. This disease may affect the respiratory tract, uterus, skin, kidneys, bladder, tear ducts, middle ear or spine. Clinical signs include discharges from the eyes and nose, loss of appetite, lethargy, head tilt, loss of balance, hind limb paralysis and laboured breathing. The infection cannot be eliminated but it can be controlled with antibiotics and you should consult our vets at once. Obesity is a common finding in rabbits, especially in females and may lead to other problems such as matted droppings and maggot infestation or fatty liver syndrome. Prevention is important and strict attention to diet, and plenty of exercise is essential. Seek veterinary advice before putting your rabbit on a diet. Many owners worry about the risks of anaesthesia in rabbits. In the past, rabbits have gained a reputation for being difficult to anaesthetise safely. However, with modern drugs and veterinary expertise there is no reason to be any more concerned about your rabbit than any other animal. All anaesthetics carry a small risk, whatever the species, and every effort is made to make your rabbit’s anaesthetic as safe as possible.